t*rexes and tiaras: watch the sun come up..
﻿﻿﻿﻿﻿﻿﻿﻿﻿ Today, I needed a transitional outfit, as I am not heading home between work and a meal out this evening with friends. I disgarded a few options, finally settling on this - Yes, it's a little more 'dressed up' than I would usually wear to the office, and yes, it's a little more 'dressed down' than I would usually be if I were off out for the evening. But I didn't have the mental energy this morning (after another night of very little sleep, not helped by the fact that I didn't get to leave my parents' house until waay after midnight after sis' birthday, gaah to my dad's drunken ranting), definitely not enough mental energy to put two different outfits together, so I think it will do. 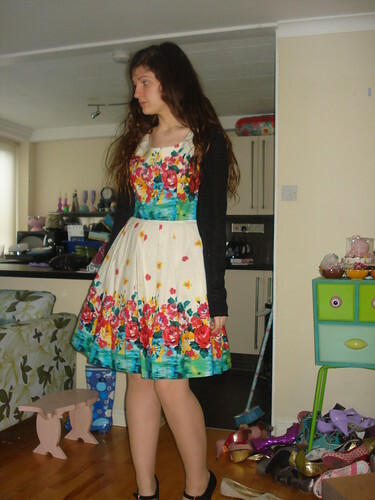 I haven't worn this dress for ages; I seem to recall not liking it very much, but I can't remember why now. Sometimes it's nice to have a break from things I guess. 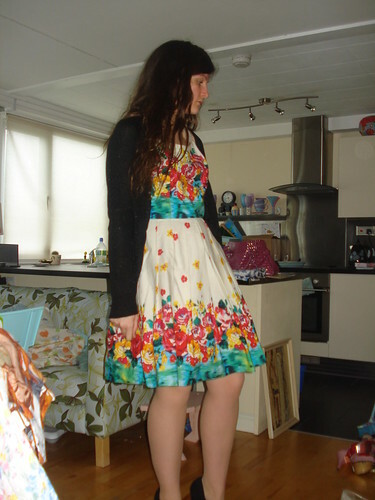 It's a lovely dress, fab colours. Your waist looks tiny in it. VERY pretty in an understated way! Thats a lovely dress, you look great in it.